One of Motorola's newest touch screen phones is headed to Cricket Wireless and available for pre-order. The Motorola Evoke QA4 first made its way to Alltel first, but now its going to be available as a no contract device for Cricket. If you pre-order the phone right now, you'll be getting an instant savings of $20.00; making it $279.99. 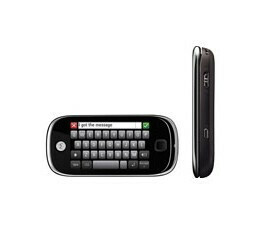 The tri-band touch screen phone will sport a 2-megapixel camera and stereo Bluetooth. So if you're really keen on getting this phone and saving money at the same time, then head on over to their web site and pre-order yours now. We have cricket in our nieghborhood but i dont think too many people are going to get this phone. I mean it will sell but i dont think better than any other cricket phone. Crickets plans are very cheap but who is going to pay $300 for a phone. Its not even a smart phone. and by the looks of it, its very chunky. And cricket is charging an additional $15 fee each month for this phones data (i think EDGE speeds... not 3G). For what its worth you can get a much better phone from one of the major companies for a better price with better features. Why anyone would be stupid enough to pay for a CONTRACT phone is beyond me. To pay extra for limited service with the chance of paying large fees if you cancel is ridiculous. Oh don't forget having a forced credit check.. I have a Motorola Cricket phone exactly like my neighbors VERIZON phone. (Same model)My neighbor pays double... I am upgrading to this phone, I will get unlimited HIGH SPEED Internet, Unlimited Long distance, Unlimited Text , Picture, Video, $49 per month no contract.. SWEEEEETT! !